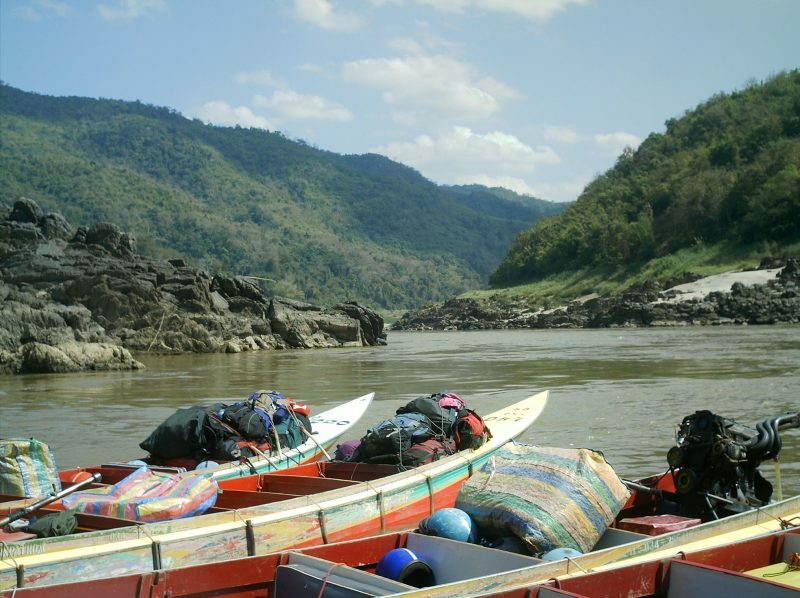 We caught the boat from Huay Xai to Luang Prabang a day later than originally planned, due to a very lethal bottle of Lao whiskey! We chose the speedboat to make this trip, and, despite being in a third world county, and at the time, the poorest country in the World, I had an expectation in my mind. On arrival at the ‘port’ we weren’t faced with a speedboat. What we saw resembled anything but a speedboat. In fact, its resemblance was more that of a canoe. A very old canoe. With an engine. Turns out, we had booked ourself two very small seats on a motorised long tail boat. After our bags were strapped onto the front of the boat, and we scrambled onto the boat, and popped on our life vests our journey began pleasantly enough. There were six of us as passengers, Darren and myself, an English couple Graeme and Charlotte, and two other travellers. There was also the driver. Whilst a little cramped, we settled as comfortably as we could. We got chatting to Graeme and Charlotte. Graeme told us how he had heard that many of these ‘speedboats’ had shattered on impact with rocks and other debris. It wasn’t quite the conversation starter we were looking for. It was however, one of the only conversations that we had for the duration of the trip. As the boat set off, and sped up, the noise of the engine increased too. It increased drastically. We had brought with us an iPod, and were sharing earphones to listen. Despite the iPod being at full volume, we couldn’t hear it. What we could hear was the droning buzz of the engine, as it hurtled along the dirty Mekong Delta. Along the river, we stopped, numerous times. Each stop, another body clambered on board. Always Lao. Luckily, never with baggage. Already feeling like sardines in a tin, new bodies were not a welcome addition. We were so pleased when someone got off, when we had a tiny bit of room to wiggle in. The practice of setting off and stopping off lasted a good couple of hours. Frustration was rising. We should have been half way to Luang Prabang. On one stop, the boys shouted to the driver, asked what he was doing. His response? There wasn’t one of course. He didn’t speak a word of English. The driver got off. Before he got off however, he took off his trousers. Just dropped them on the floor of the boat. 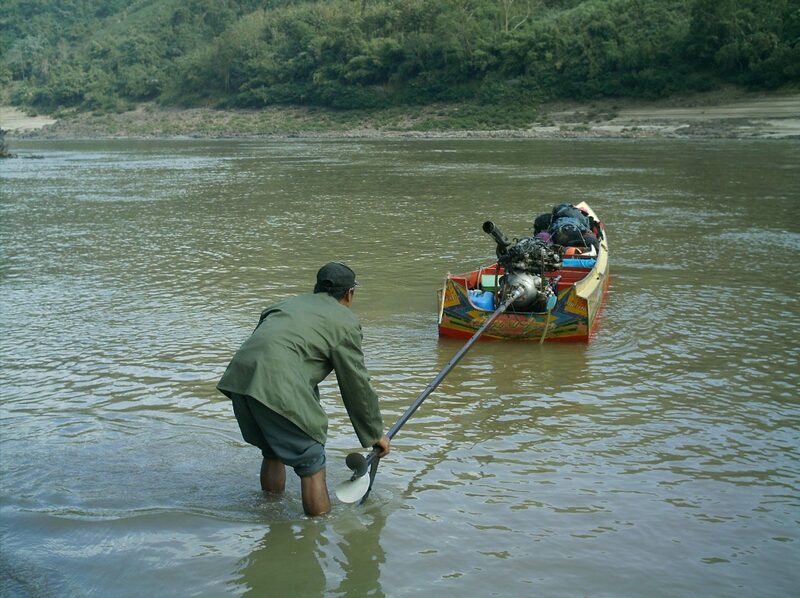 Clambering off the boat, dressed only in a pair of pants, he got to the river bank and started running. He ran, off into the distance, until we could no longer see his scantily clad body any longer. We all looked at one another, confused. It took a few minutes before any of us could say anything. We were all in a slight state of shock. There was no indication he was going to leave, and we certainly couldn’t explain why he had removed his trousers. 5 minutes passed. 10. There was no sight of the man. Three little boys cam over and played in the water. We began to wonder if we would have to drive the boat ourselves, not that we had any idea how to do so. And we had already experienced a number of near misses. After about 20 minutes, we saw a pair of pants running towards us. He was carrying something. It explained the “woosh woosh”. He had returned with a new propeller. We were soon off again, speeding down the river, waving to children who playing in the river, washing in the river, practicing their fishing skills in the river. It was a scenic route, lush trees all around, and we regularly passed small villages, shacks built on stilts, delicately positioned over the river. 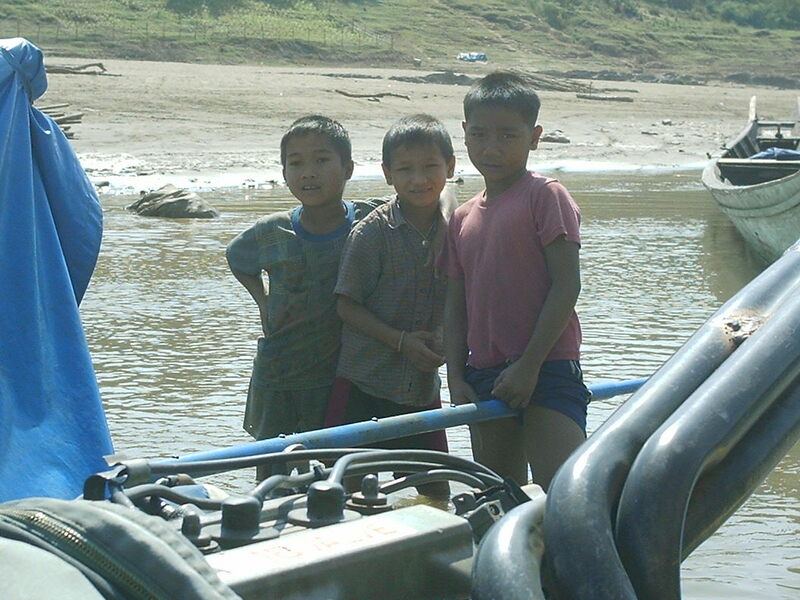 We had been travelling down the river for about 4 hours when we stopped. Yet, it wasn’t quite where we wanted to be. We stopped, at the edge of the river. Somehow, we established that this was merely a service stop, we would be able to get something to eat, use the bathroom, have a stretch! Desperate for a wee, I found the bathroom, a hole cut into the wooden floor, the wooden floor wet, seemingly through lack of aim. It was one of the lesser pleasant bathroom stops I had taken. Darren also used the ‘bathroom’ and quickly established his pee had gone downstream. This caused a problem for the on site restaurant, who were washing the plates in the river. We stuck to a packet of crisps and can of coke. We declined the opium which was regularly offered. 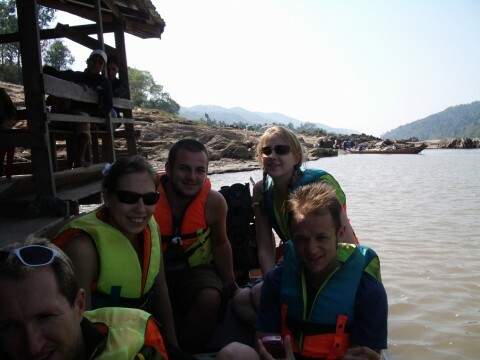 Our ears had not had chance to reacclimatise to the quietness, but it was already time to scramble back onto our boat. We set off again, and did not stop until we reached our final destination. In the end, our 4 hour boat trip had taken in excess of 8 hours, and it was already dark. Arriving in Luang Prabang, we could already tell that the area was much more developed. Our bags were untangled from the front of the boat, and we were glad that they had made it safely with us. Darren would not let anyone help him carry our bags, which made helping Graeme untangle his foot after stepping through the bamboo pier a little difficult. Charlotte and I did little but laugh. We were tired, hungry and aching. We were not in the mood for finding somewhere to stay, so as a last resort, we turned to the lonely planet book and picked a guest house. We flagged down a driver and set off. Finding somewhere to stay in Luang Prabang wasn’t quite as easy as we had anticipated. 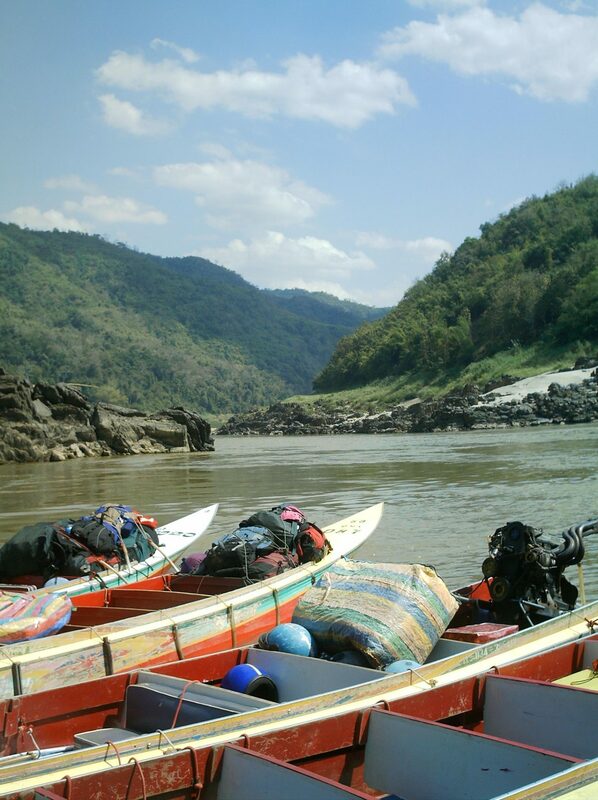 Opinion is divided as to which method is best for travelling along the Mekong Delta in Laos. 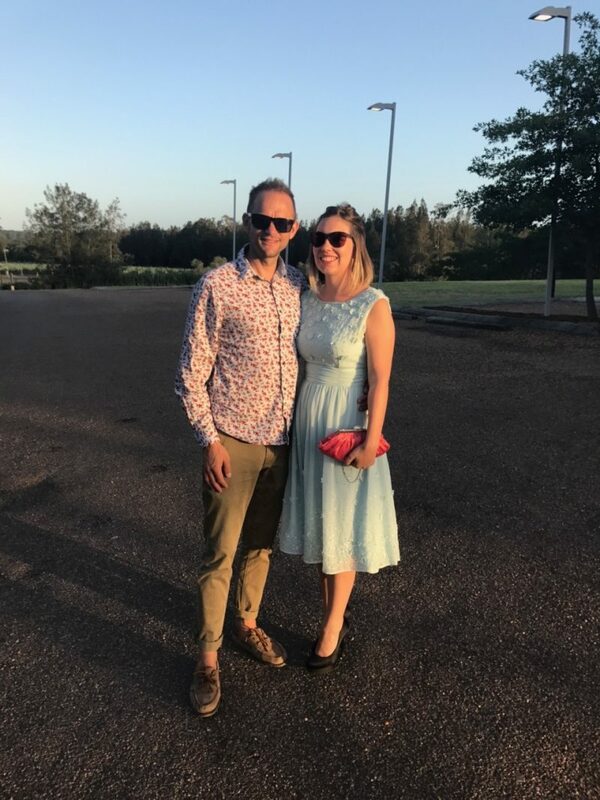 Whilst I certainly don’t relish the though of ever enduring the journey again, I am glad that we experienced the speedboat, and am relieved that we all made the journey safely! I’m not sure I would enjoy sitting on a slow boat for 2 days, either, although Ronald Robbins blog post of his slow boat journey is well worth a read!